Hornady's XTP bullet excels at both penetration and expansion--with outstanding accuracy. The 9mm XTP provides consistent half-inch or better expansion, with penetration that meets FBI protocols with ease. Most bullets have a single best use. When they are made, or tested by consumers, one aspect usually comes to the fore: most accurate, cheapest, deepest penetrating--whatever it is, it is almost always just one. Not so with Hornady's XTP. First, it is perhaps the most reliably expanding bullet made. And at the same time it still penetrates deeply. Made to satisfy the FBI test protocols, the 33 different bullets in the XTP line (from .32 up to .50) can be depended on to both expand and penetrate. The FBI protocols call for a minimum of 12 inches of penetration in ballistic gel, and XTP bullets do that easily. They also expand up to impressive diameters. I recently found that some shooters are not so impressed by the XTP expansion. They apparently want a bullet that will turn completely inside-out when it expands. The Procrustean bed of physics tells us that such expansion comes at the price of penetration. I'm not sure I want to give up penetration unless I get a whole lot more velocity in trade. The velocity range in which XTP expansion is certain is also useful. Where many hollowpoints have to be driven to the full velocity of their caliber in order to expand at all, the XTP can be counted on to expand reliably in a 400 fps range. Each box of component bullets comes with a little tag. The box of 9mms for reloading that I just opened explains that they will expand from 950 fps to 1,350 fps. As an added bonus, the Hornady XTP is one of the most accurate handgun bullets extant. Do you recall the old joke about making duck soup? "First, get a duck." 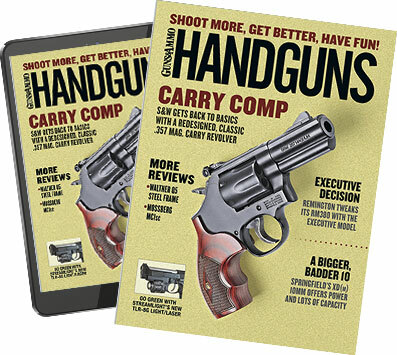 Well, if you want to contend for a title at the Bianchi Cup--one of the most accuracy-intensive shooting competitions around, where serious competitors consider a pistol that groups into 11â„2 inches at 50 yards to be the least level of accuracy they will consider using--you'll find that many handloading recipes for this sport begin with "Open a box of XTP bullets." Loaded with the best of care, and using new brass, you can expect a 9mm or .45 load out of an accurate handgun to shoot at or under the Bianchi 11â„2-inch maximum with XTP bullets. Revolvers are even easier, as you needn't worry about slide-to-barrel fit. Even in a casual reload with mixed brass, in an otherwise unaccurized pistol, XTPs will shoot well--and better than most anything. Of course, it is entirely possible that a particular handgun will shoot some other bullet better than an XTP. But the aphorism from H.L. Mencken sums it up: "The race is not always to the swift, nor the fight to the strong. But that's the way to bet." Besides target and defensive use, the XTP's accuracy, expansion and deep penetration makes it a good choice for hunting, too, which Hornady recognizes. In addition to producing XTPs for defensive calibers and uses, the company also makes hunting versions such as a 180-grain for the .357 Magnum; heavyweights for .44 Magnum, .454 Casull and .480 Ruger; and the .500 XTPS for the .500 S&W. Since not all those who shoot also reload, Hornady offers the XTP in factory ammo. Of late I have been using a lot of the company's 9mm loads, and I've found them (as expected) brilliantly accurate and reliable in expansion and penetration. Hornady doesn't load its 9mm rounds as hot as some other brands do. The listed velocities are a bit less than 100 fps slower than other brands claim and a bit more than 100 fps slower than some other brands actually deliver. However, less velocity is not always a hindrance. A milder load is usually easier to shoot, allowing for faster follow-up shots, quicker recovery and better-placed shots. And they're no slouches in penetration, meeting the 12-inch FBI standard with ease. The lightest XTP (which in all bullets with all other things being equal means shallowest penetrating) does 15 inches. The 124s can be counted on for 16, and the 147s will give you 18 inches or more--all with generous expansion. I ran a bunch of XTPs through a selection of 9mm handguns to get a handle on velocity and terminal performance. What I found was what I expected: deep penetration, excellent expansion with no hint of bullet breakup, and stellar accuracy. Of the three weights, I found myself leaning more and more to the 115-grain. That's heresy for a .45 ACP proponent, I know, but it is hard to deny the attractions: soft recoil, excellent accuracy and 15 inches of penetration, plus or minus half an inch. The mild recoil combined with a soft muzzle blast has to be accompanied with a moderate chamber pressure, making it a loading highly unlikely to be a problem in hot weather. The 115-grain bullet in the accompanying photo passed over the chronograph at 1,101 fps and then traversed 151â„4 inches of ballistic gelatin. This one had the largest diameter of expansion, .528 inch; the smallest measurement of the least-expanded was .495 inch. Even a dyed-in-the-wool big bore shooter is hard-pressed to quibble with performance like that, and were I using only a 9mm as a carry gun, it would be most attractive. In the winter, if I had to deal with miscreants wearing heavy clothing, the 147s would ensure penetration even after getting through leather jackets or down vests. Yes, the 9mm has never been touted as a death-ray. It won't exit the far side of a moose after expanding to a full inch in diameter (no handgun round will). But for a compact gun or a comfortable concealed carry gun, the 9mm has a lot going for it. And the Hornady XTP should be high on your list as the load to carry in said blaster. Those carrying for defense should consider the accuracy as a bonus, to make your scores at the gun club or during CPL renewal look even better.